photo credit Carrie Obry. Thanks Carrie! ​The Independent Bookseller™ is maintained by Robert Martin. To be clear, I am not "The Independent Bookseller" -- that would be you, for whom this site is dedicated. This is a website for and about booksellers. ​Learning how to learn about this industry is a process. Over the course of my career I've developed a suite of tools for my personal use and overall edification. After several conversations with booksellers and others in the industry, it became clear that more than a couple booksellers out there might find them useful, too, so I decided to make them public via this here site. The resources, content, and opinions found on The Independent Bookseller™'s website, social media pages, and weekly newsletter are intented to be purely supplemental and complementary to the work of all book industry associations, publications, and service providers, without which nothing on this site or in this industry would be possible. If you have any questions about the methodology behind anything on this site, please contact me. ​​Robert Martin is the executive director of the Independent Booksellers Consortium. 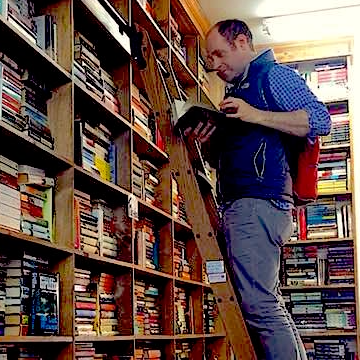 He has worked as the director of operations for the Midwest Independent Booksellers Association and managing editor for Rain Taxi Review of Books. Before working in the book industry he was the senior editor for Masterplans, a business consulting firm that guides entreprenuers through the startup process. He is a writer, musician, backpacker, and father. Feel free to reach out for any reason, any time.